Tracy Reese is an American designer whose work is timeless, classic and always looks good on a woman. 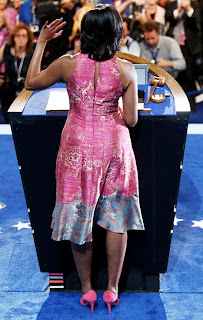 She is one of my personal favorite designers and I was happy to see that First Lady Michelle Obama chose to wear one of her dresses for her speech at the Democratic National Convention. Black (African-American) designers rarely get opportunities like this on a national scale to have their work seen by the masses. The dress was custom made in a silky rosy pink, with grey around the hem. Sleeveless, it showed off her strong arms and the silhouette was fitted with the a full skirt. She wore the Everly Suede heels in rhubarb from J. Crew which were the perfect finishing touch to her look. Twitter was buzzing with tweets about what the First Lady wore. Tracy Reese herself tweeted, "So honored." when she appeared onstage in the dress. This isn't the first time she's worn Reese. She was also seen at the London Olympic games wearing a pre-fall ensemble from the designer.